I am looking out the back door of our cabin and it is still dark out. The rain is hitting hard enough to nearly drown out the sound of the meditation music in my headphones. For many rainy days are a nuisance and days like this can be a source of frustration. However, this morning I find myself enjoying the sound of rain hitting the roof and with it and the inspirational music in my imagination they become prophetic reminding me in spite of the lack of light outside THE LIGHT still shines. 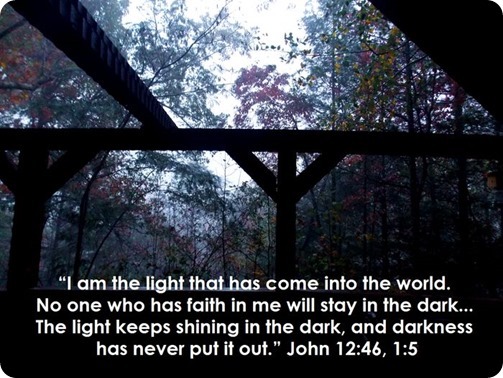 Not only does The Light continue to shine but the symphony of the rain and the music together become words of the Father, words each one of us need to hear when life becomes dark and dreary and storm clouds temporarily try to block The Light. While God may not be the source of the rain storms that block The Light driving us indoors God always accompanies us through them with a divine purpose in the outcome and while you and I may never know the purpose we will have intimacy with God through The Light.